Whitney Art Works kicks off summer with works by two artists who create masterful explorations of the everyday. Richard Hutchins’ lush, multi-paneled oils are exhuburant studies of the cotton-candy colored corners of suburban America, while Brian Lynch’s works on paper capture the essence of his subject, people on the street, with the quick gesture and powerful movements that typify city life. Richard Hutchins exhibits paintings from his ongoing series of works that explore the proliferation of suburbia. 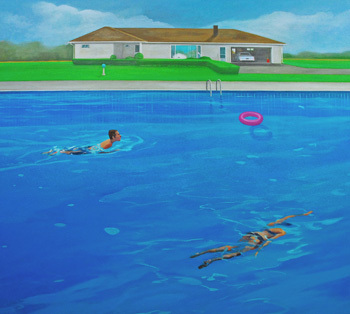 His imagery of swimming pools, cars, houses and sprinklers, and distant figures swimming and mowing the lawn are unflinching tableaus of suburban life in all its Technicolor glory. Many of his works are spread across multiple panels, with the serial nature and detached viewpoint suggesting a narrative but keeping the viewer behind its protective gates, outside looking in. 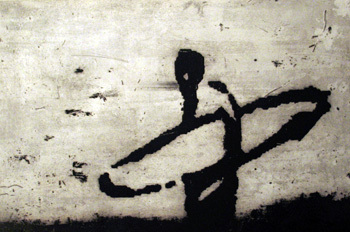 Brian Lynch’s work draws its power from the direct approach and sense of immediacy. Working in a variety of media on paper he creates character and narrative in his figural studies through a few masterful strokes of line. Neighborhood toughs in puffy parkas pose on corners, workers wait for the bus and the elderly shuffle by with their shopping carts, all captured with by Lynch’s expressionist and energetic line. In the artist's own words, "I try to keep the imagery of my work within the realm of my own experience. Everyday experiences, humorous situations and street life are the base from which much of my work evolves. In my recent prints, I have been investigating the interaction between digital technology and the hand drawn image. 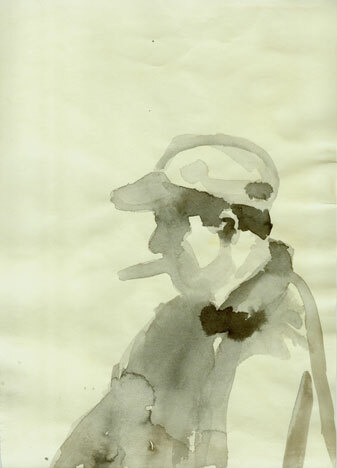 This exploration has led me to adapt traditional printmaking methods with drawings made in a hand held Palm Pilot. In a Palm Pilot, the lines are cold and reduced to pixels, yet the image still retains the descriptive and expressive qualities of original drawings. Small, immediate sketches become the basis for large prints that paradoxically suggest both the intimacy of direct observation and the technological interventions of contemporary digital media." (sub)urban: works by Richard Hutchins and Brian Lynch are on view from the June 6 to June 28. A reception for the artists will be held on June 6 from 5-8pm during the First Friday Art Walk. Gallery hours are Wednesday through Saturday from 12-6 or by appointment. Put 45 York Street back on your First Friday map! Our friend Daniel Pepice will be presenting New Systems, on view June 6 from 5 - 10pm and throughout the month by appointment. To schedule an appointment email vibrantvaf@aol.com.